This book constitutes the thoroughly refereed post-conference proceedings of the 9th International Symposium on Computer Music Modeling and Retrieval, CMMR 2012, held in London, UK, in June 2012. The 28 revised full papers presented were carefully reviewed and selected for inclusion in this volume. 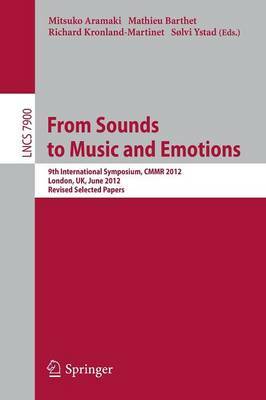 The papers have been organized in the following topical sections: music emotion analysis; 3D audio and sound synthesis; computer models of music perception and cognition; music emotion recognition; music information retrieval; film soundtrack and music recommendation; and computational musicology and music education. The volume also includes selected papers from the Cross-Disciplinary Perspectives on Expressive Performance Workshop held within the framework of CMMR 2012.